This afternoon, the jury found mass murderer James Holmes guilty on counts ranging from the 12 counts of first degree murder to dozens of counts of attempted murder for the 70 people he wounded that night. We have largely avoided covering the Holmes trial for one big reason – we did not want to give this scum of the earth the media attention he desperately craved. But, we will cover this decision because it hopefully will bring some sense of justice to victims’ families who have lost so, so much due to Holmes’ despicable lack of respect for human life. In his defense, this joker, pun intended, expected the jury to believe that he was not guilty by reason of insanity. But, he spent months carefully planning his heinous act. His legal team laughably suggested that Holmes didn’t realize that his victims would want to live. That defies basic human and, frankly, animal nature. Each person Holmes icily gunned down had a burning desire to live that he tamped out in a few short minutes. Fortunately, the jury didn’t buy it. The next step for this monster is sentencing. The only appropriate sentence would be the death penalty. 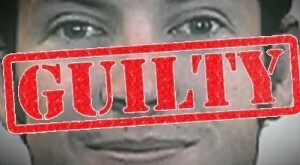 If he is found guilty, the jury, apparently, will meet to determine whether he will face the death penalty. Let’s hope the jury gives him the maximum punishment, and let’s hope that John Hickenlooper isn’t in office to stall it.